There are so many beautiful things that make up a wedding – stunning venues, gorgeous flowers, and lush linens. But one part that really sticks out to us is ceremony spaces. It is the space where our amazing couples become husband and wife. They are often the centerpiece of the whole wedding. So I thought it would be fun to look back at a few of our memorable ceremony spaces our brides have chosen and give you our readers some inspiration for your big day! 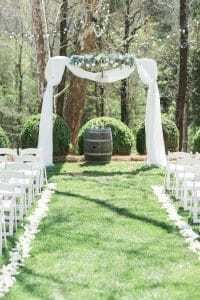 This amazing ceremony space is just one of three to choose from at Rolling Hills Farm in Monroe, North Carolina. Marion chose this modern arbor to exchange vows under. Accented with a stunning antique chandelier, it was a perfect place to say “I Do”. This sweet ceremony space located at Vesuvius Vineyards is the ideal location for an outdoor wedding, isn’t it just swoon-worthy? Bride Andrea chose to line the aisle with flower petals making her walk down the aisle truly one to remember! 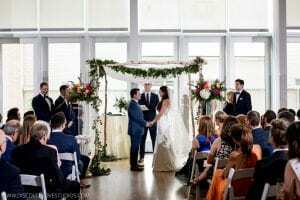 Meghan and Lee married under a Chuppah at the Mint Museum Uptown. Their Jewish ceremony was truly one to remember full of some many great traditions. The Dairy Barn in Fort Mill, South Carolina set the scene for this romantic love story. Rachel chose a unique cross as the background for here ceremony space and accented it with some truly amazing florals. I think it’s safe to say we’ve seen some pretty amazing ceremony spaces! But then again we have some pretty amazing brides too!